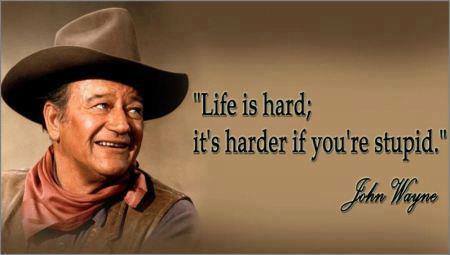 John Wayne (May 26, 1907 – June 11, 1979) was an Academy Award-winning, American movie actor. He has become a symbol of American man. 4. A man deserves a second chance, but keep an eye on him. 5. Life is tough, but it’s tougher if you’re stupid. 6. Sure I wave the American flag. Do you know a better flag to wave? Sure I love my country with all her faults. I&apos;m not ashamed of that, never have been, never will be. I was proud when President Nixon ordered the mining of Haiphong Harbor, which we should have done long ago, because I think we&apos;re helping a brave little country defend herself against Communist invasion. That&apos;s what I tried to show in The Green Berets and I took plenty of abuse from the critics. 7. I won&apos;t be wronged. I won&apos;t be insulted. I won&apos;t be laid a-hand on. I don&apos;t do these things to other people, and I require the same from them. 8. Now you understand. Anything goes wrong, anything at all… your fault, my fault, nobody’s fault… it don’t matter… I’m gonna blow your head off. It’s as simple as that. 9. The reason there are so many stupid people is because it&apos;s illegal to kill them. 10. I may sound like a bible beater yelling up a revival at a river crossing camp meeting but that don’t change the truth none, there’s right and there’s wrong. You gotta do one or the other. You do the one and you’re living, you do the other and you may be walking around but you’re dead as a beaver hat. 12. Never apologize, mister, it’s a sign of weakness. 13. When you come to see a picture of mine, I want you to know that I’m not going to do anything that will make you uncomfortable. I want you to know that you won’t be disappointed in me. 14. If everything isn&apos;t black and white, I say, “Why the hell not? 15. When you stop fighting, that’s death. 16. Women have the right to work wherever they want, as long as they have the dinner ready when you get home. 17. My hope and prayer is that everyone know and love our country for what she really is and what she stands for. 18. Now you understand. Anything goes wrong, anything at all… your fault, my fault, nobody’s fault… it don’t matter… I’m gonna blow your head off. It’s as simple as that. 19. You’re short on ears and long on mouth. 20. I have tried to live my life so that my family would love me and my friends respect me. The others can do whatever the hell they please. 21. A goal, a love and a dream give you total control over your body and your life. 22. Life is getting up one more time than you&apos;ve been knocked down.